Add this ottoman to your living room. 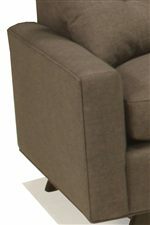 This piece features a cozy boxed seat cushion and a mid-century modern wood base with angled feet. For a complete set, pair this ottoman with the coordinating chair. This piece is available in multiple fabrics and leg finishes to choose from. 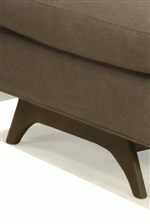 The 1482 Mid-Century Modern Upholstered Ottoman by McCreary Modern at AHFA in the area. Product availability may vary. Contact us for the most current availability on this product.